Meetup groups are locally-organized groups that get together for face-to-face events on a regular basis (commonly once a month). Anything that brings together 2 or more people to share their WordPress experiences counts — there’s no minimum number of attendees or required format. Meetups are volunteer-run with volunteer speakers. In cases where a modest attendance fee might be necessary, this fee should only cover the costs of the meetup and should not be used to pay speakers or organizers. We also ask everyone that organizes WordPress Chapter Meetup to uphold the principles of the WordPress open source project, including the GPL. This helps protect the user/attendee, who might not realize that by using a non-GPL plugin or theme, they are giving away the rights that WordPress provides them. If there is not a meetup group in your city but you would like to start one, fill out our meetup interest form and we can set up a new group for your city and make you the first organizer. If you have a group already but are not using meetup.com and you’d like to, use the same form, but make sure to include the URL for your existing group’s online presence (Facebook, independent site, etc). Meetups were happening long before we had a structure like the WordPress Community Support PBC in place to cover costs. Now that we are able to facilitate things, it means organizers don’t have to pay hundreds of dollars a year in hosting fees, and that groups can be more open for community participation since the “owner” doesn’t have to worry about their reputation being affected by the actions of others in the group. The WordPress Community Support PBC takes over payment of meetup.com dues and is listed as the primary group organizer. The original owner is listed as co-organizer, as are any existing co-organizers. WordPress now “owns” the meetup.com account, and everyone running events is on equal footing. Organizers retain access to the group tools on meetup.com. The group name and URL remain the same. The design of your site is unchanged (unless you are using a “fauxgo” or misspelling WordPress, in which case we’d ask you to fix that). 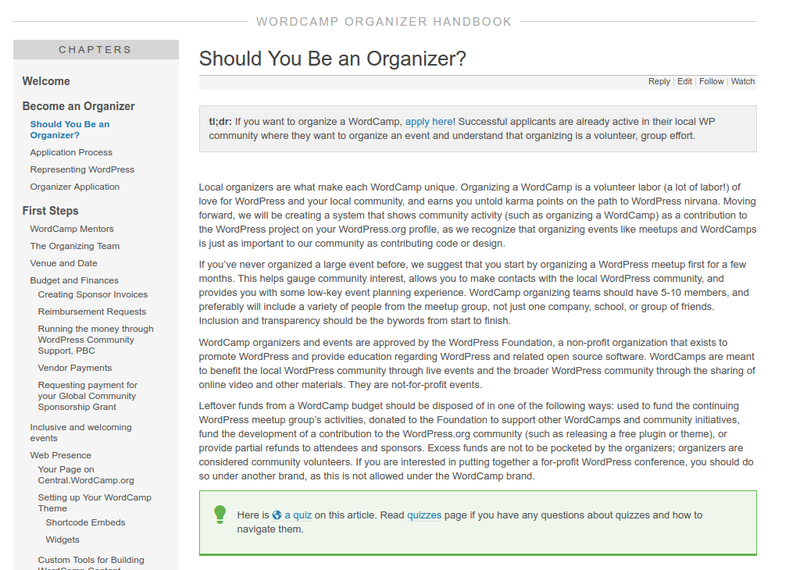 Organizers will be included in a monthly communication that connects them to the WordPress project and to other meetup organizers (how much or little you choose to get involved is up to you). A survey will be sent to all members of the group to gather feedback about the meetup. Results will be shared and discussed so that if there’s something we can do to facilitate more activity/happier members, we can work together to figure out what that might be. Videos of presentations (or tutorials, or etc) from your meetup group will have streamlined access to publication on wordpress.tv. We’ll send you some WordPress swag to kick things off if you don’t have any kicking around from a recent WordCamp. It is possible for Community Support to cover costs such as venue rentals when donated space can’t be found, and can work with meetup organizers to determine what costs and/or supplies may be provided by the central account to make organizing events easier – more information here. If you currently require people to submit an application to join your group, we ask that you remove that requirement. WordPress meetup groups are open to all who are interested. You can still ask those questions on the regular “join this meetup” form. We ask that any member of the group be allowed to organize events (this is a setting in group tools) rather than the organizers acting as gatekeepers. If someone wants to organize a Saturday morning WordPress coffee shop get-together that only 5 people attend and you want to organize a more formal presentation for 80 people, both of those are valued by us. The more people getting together and connecting to talk about WordPress, the better, and having only a few people organize events automatically limits their number and scope. It’s definitely a change — it goes from “This is my group” to “This is a community group I’m a leader in” and we won’t lie, it does require a shift in thinking for groups that have only allowed one or two people to organize events. That said, that shift — for WP meetups to be community groups where everyone can organize events without gatekeepers — is what we’re going for. So you’d be responsible for focus and consistency in your own event series, but not for others (though hopefully anyone choosing to organize would talk with other organizers and learn from their experiences). That’s about it! Oh, and follow the 5 good-faith rules mentioned at the beginning. If you have a problem with one of them, we should talk about it. To request that your existing group join the central account, use the same meetup interest form. Say “yes” when it asks if there is an existing group and provide the URL. In the end of some of the handbook pages, you will be presented with a quiz to test your knowledge of the material that we have covered. The goal is to help knowledge retention and to make sure you have noticed all of the important details. You need to get all of the answers correct in order to pass it, but do not worry – you can retake the quizzes as often as you like in order to the lofty goal of a 100% pass rate. Here is what a reference to a quiz looks like. 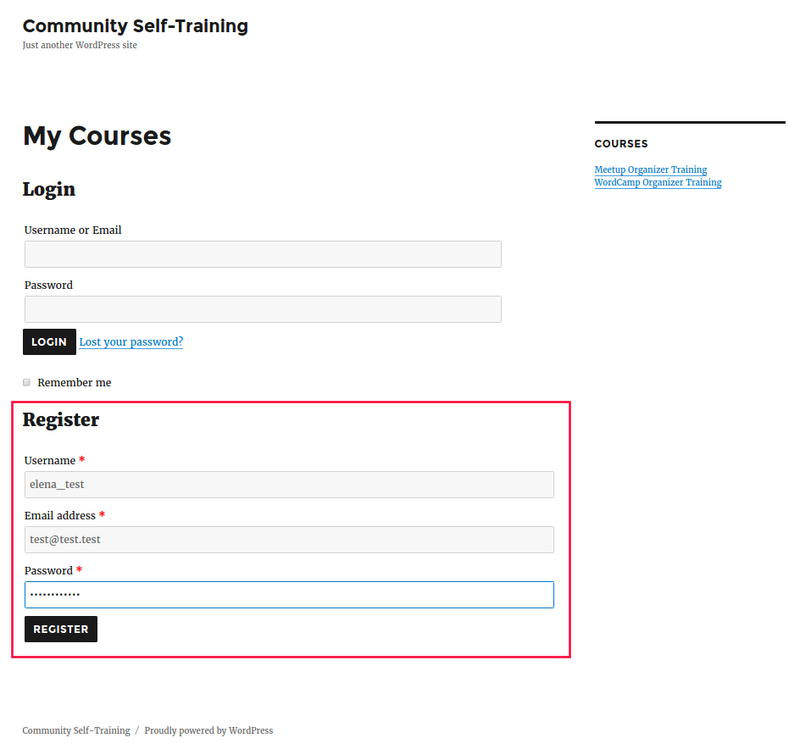 To be able to use quizzes you need first to register at https://community-self-training.mystagingwebsite.com. If you are not registered yet, find an instruction guiding you through the process below. 1. Go to My Courses link. Scroll the page a bit and fill in the registration form. 3. Select Meetup organizer training from the menu the right. 4. Subscribe to a course. 5. After you see “In progress” status appear below the course name, you are all set to go back to handbook site and start/continue reading it. As you are logged in to the site which hosts quizzes, you can open the link you encounter at the handbook pages and check your knowledge. Good luck with the quizzes! And please use the #community-team channel on our Slack to report if a quiz question is incorrect or ambiguous.